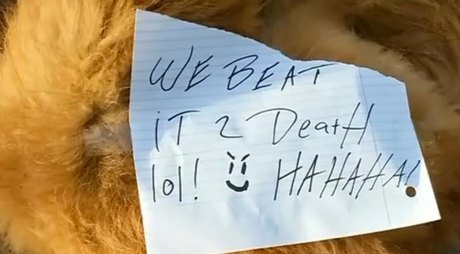 A small dog was beaten to death not far from his home then returned to his family with a cruel note bragging about it. Fox, a Pomeranian was let outside friday afternoon and then disappeared. The following morning the owners were awakened by a neighbor who showed them their deceased family pet. The dog was left along with a note that read “We beat it to death. lol hahaha” The note also included an evil smiley face. Initially they thought the 7 year old pooch passed away from natural causes and dismissed the note as a joke but took him to the vet to find out. Sadly the vet found broken teeth and bones and other indications of a violent death. The perpetrators are most likely local because the dog showed signs of the crime taking place elsewhere but does not wear a collar and was returned to his home. Whoever did this knows where the dog lives. If you have information regarding this case please come forward and call Pembroke Pine Police at 954-431-2200. This was a cruel act of brutality and those responsible must pay for their crime. The family has posted flyers and is seeking justice for Fox. It’s also an important lesson that we should never leave our dogs outside in an unsecure area unattended. Unfortunately there are bad people out there who could do harm, coyotes, and they could even be run over by a car. Please take care of your pups and never let them run around outside unattended.